A 90 year old former U.S. president, and his much younger colleague from Norway, have become a crusading international dynamic duo determined to end the immediate Gaza suffering that is both “unsustainable and intolerable”. (CHICAGO) Former President of the United States Jimmy Carter and Gro Harlem Brundtland, former Prime Minister of Norway, concluded their trip to Israel and Palestine with a statement calling for “meaningful steps to stop the humanitarian crisis in Gaza and reconcile the different Palestinian factions”. The statement, released by the Elders’ media office, said Carter and Brundtland “regretted that they were unable to go to Gaza on this visit but expect to have future opportunities to travel there, to witness the situation firsthand”. The two Elders said they remain convinced that “only a two-state solution can bring a just and lasting peace for both Israelis and Palestinians”. We came here to visit Gaza, the West Bank and Israel. As you know, we were unable to go to Gaza. We deeply regret not having had the opportunity, on this occasion, to see the situation there at first hand. However, over the past three days we have received comprehensive briefings from many independent experts, including Israelis and Palestinians and the UNRWA Commissioner-General, which unfortunately have confirmed our worst expectations. The situation in Gaza is unsustainable and intolerable. A complete paradigm shift is essential. This shift demands the lifting of the siege. It also requires an end to Israel’s policy of separating the West Bank and Gaza. It demands freedom of movement for people, so that families can be united, students can study in the West Bank or abroad, and patients can receive the medical care they need. In short, all the aspects of normal life that people in our own two countries, and in Israel, take for granted. Without this paradigm shift, which most of the world recognises as vital, we fear that further conflict is inevitable. In his separate statement, Carter added that “reconciliation between [the Palestinian parties] Fatah and Hamas, and the full establishment of the government of National Consensus in Gaza, is vital to end further suffering”. 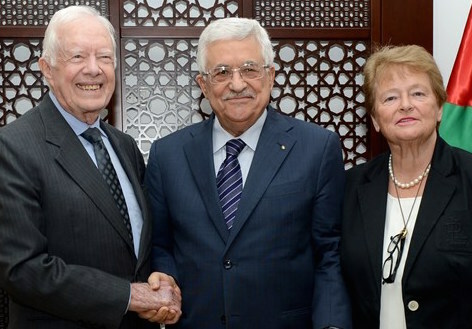 ￼￼￼On Saturday, the final day of their trip, Carter and Brundtland conferred with Palestine President Abbas in Ramallah. The Palestinian media news outlet, Ma’an, reported that Abbas used his meeting with the Elders “to emphasize the importance of speeding up reconstruction efforts in Gaza, in particular pressing the need for donor countries to meet their pledges”. In Ramallah Saturday, Carter and Brundtland also met with key members of the Palestine Liberation Organization and other political figures to discuss the struggle to achieve Palestinian unity. Included in the discussion were: Nabil Shaath, Husam Zumlot and Mohammed Shtayyeh from Fatah; Mustafa Barghouti, Secretary-General of the Palestinian National Initiative (PNI) (Al Mubadara); Majida Al-Masri, Former Minister of Social Affairs; Basam Salhi, Palestinian People’s Party; and Omar Shehada, from the Popular Front for the Liberation of Palestine and Chief Editor of Al-Hadaf Magazine. Mustafa Barghouti, well-known Palestinian political figure, is at the far right corner in the picture above. President Carter and Gro Harlem Brundtland are across the table at left. The trip’s original schedule had called for the Elders to travel to Gaza to confer with Hamas and other political figures. That trip was cancelled for reasons still not disclosed. Before the Elders arrived, Israel’s government had already announced it would not allow any of its leaders to meet with the Elders. Also forbidden was what would have been essentially a ceremonial visit between Israeli President Reuven Rivlin and former U.S. President Jimmy Carter. This is the action of a nation which has locked itself into a self-imposed isolation from any outside interaction it deems unfriendly. Israel holds tight military control over the West Bank and Gaza. This suggests that the only reasonable explanation for the cancellation of the Elders’ Gaza visit, is that Israel wanted to hide as much as possible the destruction of Gaza from outsiders, especially those with the influence of the Elders. Since highlighting the humanitarian crisis in Gaza was one of the delegation’s “key aims” during the visit, they were deprived of first-hand personal observation. This has not, however, deterred them from using their visit to highlight the suffering in Gaza. which, most recently, was left behind by the devastating Israeli military attacks on Gaza in the summer of 2014. The Elders said that since their last visit to Israel and the occupied Palestinian Territories in October 2012, they have watched “with dismay the intensification of animosity and misunderstanding between the two parties. It was evident in statements following their three-day visit to Israel and a part of Palestine, that Jimmy Carter and Gro Harlem Brundtland will continue to use their influence to end Israel’s self-imposed world isolation, an isolation damaging both to Israel and Palestine. The picture at top of former President Carter and former Norway Prime Minister Brundtland, is from The Elders’ website. The second picture is from Ma’an News. The lower picture is from The Elders.